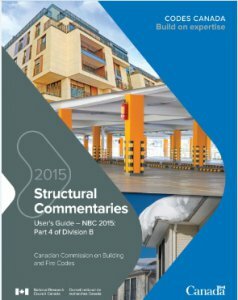 The Structural Commentaries (User’s Guide – NBC 2015: Part 4 of Division B) is intended to help Code users understand and apply the design requirements provided in Part 4 of Division B of the National Building Code of Canada 2015 (NBC). It contains valuable background information and, in some cases, suggested approaches to certain design questions related to structural sufficiency such as limit states design, snow, rain and wind loads, and design for seismic effects. This new edition of the Structural Commentaries reflects technical changes incorporated into the NBC 2015 and provides additional information on issues likely to be addressed in the next edition of the NBC. Topics covered include blast loads, snow and live load combinations, guards and walls acting as guards, parking structures and garages, wind loads on solar arrays, and the design of structural glass. Extensive material supporting the changes related to seismic design in low-hazard locations and the determination of design seismic load is also included. Additional information is provided on new Code provisions such as those on period-based site coefficients, irregularity for gravity-induced lateral demand, Seismic Force Resisting Systems (SFRSs), flexible diaphragms, seismic isolation and supplemental energy dissipation systems, elevators and pallet racks. Information on the seismic upgrading of existing buildings has also been updated.